Find your yardage to the front, back and middle of green with this sleek and stylish golf GPS Watch. 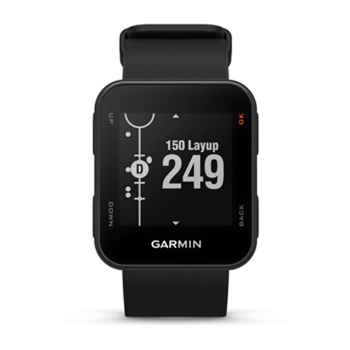 Preloaded with over 41,000 courses worldwide the S10 from Garmin keeps you in the know wherever the game takes you! 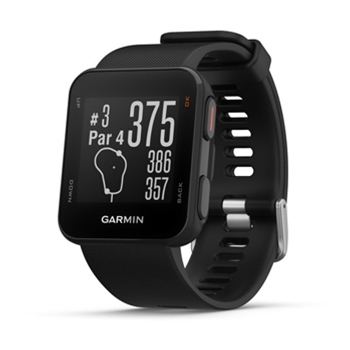 The Garmin Approach S10 is a sleek combination of a stylish watch with a built-in golf GPS. Preloaded with over 40,000 worldwide courses and a rechargeable battery with life up to 12 hours in golf mode, this device can be taken anywhere and last through all 18 holes of your game. Free course updates allow you to keep up with the vast addition or changes of courses that you will be visiting. Easy to use, the Approach S10 is virtually ready to go out of the box and requires minimal setup. An internal high-sensitivity GPS receiver quickly and accurately locks into satellites to show you green distances, hazards, and doglegs keeping you alert as to what to expect on your next hole. The S10 Approach is so intuitive, it can automatically detect your location and provide you with the closest courses to where you are, a great tool if you are visiting an unfamiliar area and want to get a round of golf in. A few important features of the Approach S10 include yardages which will give you accurate information for front, back, and middle of the green in a large number format that’s easy to read, hazards and course targets which can quickly identify sand traps, water hazards, and more improving your game throughout your playing time. View and measure layup and shot distances for improved accuracies through each hole played. Download the Garmin Golf app to your compatible smartphone and set up your own tournament event so you and your friends can compete against each other. Gain the ability through your Garmin Golf app to compare and share data as well as view rankings and stats all in one place. Your Approach S10 will wirelessly send data to the Golf app so you can quickly store and review game data all in one place. 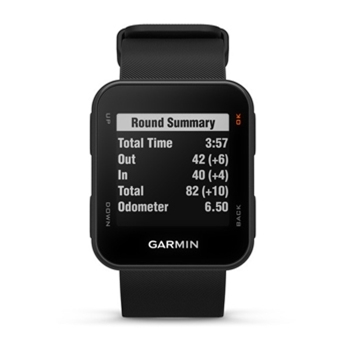 For an easy to use wrist-won powerhouse of information while on the course, the Garmin Approach S10 is the recommended choice. A Golf GPS that doubles as an everyday watch! The Approach S20 from Garmin offers a stylish, fully-hinged sleek design that can be worn day in and day out. Preloaded with over 40,000 courses around the world, the S20 has a 1.3” Sunlight Viewable display with GreenView, Stat Tracking, Accurate Yardages and so much more. Rugged and Waterproof the S20 includes a rechargeable battery.